The doctor I visited asked had I ever undergone surgery. He worked in a building on Gibson Avenue, near the airbase. The building he worked in was near the very spot where the first American astronauts came to have tests done, before each got the chance to roar into space on the tip of a large flaming stick. The astronauts came to Albuquerque in the late 1950s to be examined by a doctor named William R. Lovelace. He had developed the first high-altitude oxygen mask, while working at another airbase, in Dayton, Ohio, a place in America, coincidentally, where my twin brother lives and works. Lovelace had been hired by NASA to make sure that the spacemen could withstand the rigors of rocket flight, could successfully go to and return from a place where there was no oxygen or gravity at all. Dr. Lovelace was a New Mexico native. He founded a clinic in Albuquerque that became a set of hospitals that still bear his family name. Now, there are advertisements for this hospital all over town. Do me a favor. Next time you see one of those signs, while you’re thinking about your health, like the sign asks you to, take a moment and look up into the sky. Anyway, there is a replica of one of the metal sticks that the Gemini 7 used to visit outer space, right here in Burque. It’s parked at a museum near the edge of town. The museum chronicles the history of large flaming sticks. Some of the sticks, as I mentioned before, were used to lift fragile and living human bodies into the unexplored void that surrounds the earth. Other versions of these magic sticks had a less noble purpose, however. That purpose was also defined here in Albuquerque and in the areas that surround our fair city. But back to the surgery thingy, which also took place in Albuquerque and has got some outer space stuff going on, too. I was born with pointed ears. The ears I was born with were not quite as pointy as Mr. Spock’s ears, but they were very noticeable none the less — just about every one of my school chums referred to me as Spock, a situation which amused me but horrified my parents. After one of my teachers told my mom and dad that casual parental marijuana use had been shown to have produced minor congenital defects of the sort I manifested, after the sailor framed his retort with the most elegantly insulting Spanish ever heard in Rehoboth New Mexico, my outraged mother decided that enough was enough. She made an appointment with a plastic surgeon in Albuquerque. His name was Gooding and he was a tall thin man with big hands. He examined me, asked me how I felt about my ears. I pretended to be stoic and logical and did not smile or smirk when he took pictures of my profile with a large Polaroid camera. Afterwards, my dad took us to the Los Altos Twin Cinema to see the new Peter Sellers film, which was about a bumbling French detective. I couldn’t concentrate on the film and wished instead that he had taken us to see Escape to Witch Mountain, a film we had heard was about outer space. It happened to be showing on the other screen. When it was quiet in our half of the building, due mostly to the fact that American audiences really didn't understand Sellers' brand of humor, I strained my pointed ears trying to hear what was going on next door. Two weeks later, my family returned to Albuquerque. I was admitted to a small hospital in the Northeast Heights. The hospital was called Anna Kaseman Hospital. Everything was new and glistening and clean at that hospital, which resembled the inside of a fancy spaceship, as far as I was concerned. I was treated like royalty there. I was treated like a very high emissary from another world, I imagined at the time. The next evening (which, by the way, was spread out against the sky), I was wheeled into the operating room and anesthetized. When I awoke, my head was bandaged and my brother was standing over me in the recovery room. 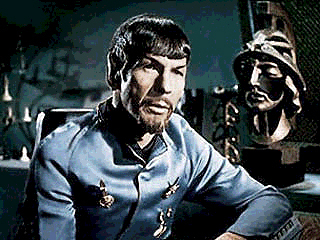 —How you doing, Spock? How was space? —It was dark and quiet, but warm. Nothing like books or television... or movies. Not quite what I expected. A man in gray brought in some white ice cream, my smiling parents trailing behind. We looked out the window at the city of Albuquerque, where it was still nighttime, but on the verge of dawn, a time when there is faint light on the edge of things that you would never guess is coming from a huge fire in depths of eternal darkness. Note: This piece was cross-posted to a writing blog called Report on City 119n. It is a blog run by the author of this post. The Eds.